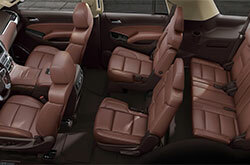 What Does the New Tahoe Offer? America's favorite SUV returns to Vandergriff Chevy with a newly available engine, a 6.2-liter V8 and 10-speed automatic transmission, both of which are offered on the brand-new RST Performance Edition package. 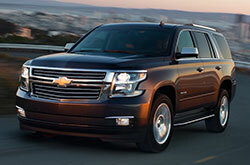 Otherwise, the Tahoe carries over the same first-class qualities that it had on last year's models. 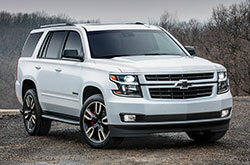 For further details, continue reading our 2018 Chevy Tahoe review below. Available in LS, LT and Premier, the SUV can be tailored to suit a variety of driving needs. The entry-level LS comes fitted with sporty 18-inch alloy wheels, automatic wipers, heated mirrors, side steps and roof rails. There's also a trailer hitch receiving and wiring harness, which make it easy for you to hook up your boat and camper. 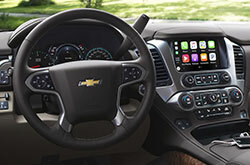 Excellent connectivity features like Bluetooth, five USB ports and Apple CarPlay and Android Auto will help you stay connected on the road. 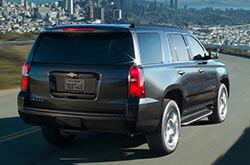 Upper trims tack on a variety of other amenities, as noted by 2018 Chevy Tahoe reviews. They include things like leather upholstery, navigation, a sunroof, power-adjustable side steps and a 10-speaker Bose sound system. Almost every 2018 Chevy Tahoe in Arlington is powered by a 5.3-liter V8, delivering 355 horsepower and 383 pound-feet of torque. The powerhouse is paired to a six-speed automatic transmission that is matched to either a rear-wheel- or four-wheel-drive configuration. As noted above, trims that are equipped with the new RST Performance package come fitted with a more powerful, 6.2-liter V8 and 10-speed automatic. When it comes to world-class safety gear, the 2018 Chevy Tahoe in Arlington has got your back. 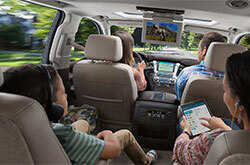 Standards include a rearview camera, OnStar telematics and a teen-driver system that lets parents keep track of their child's driving habits. On top of these advantages, the SUV can also be had with several driver aids, including blind-spot monitoring and forward collision warning with low-speed automatic braking.